This month, the City of Langley is hosting three public meetings throughout the community. These meetings are an opportunity to see what the City has been working on, ask questions, and provide feedback. 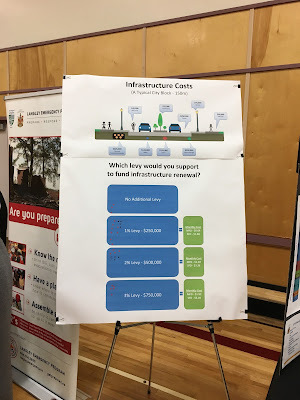 The City did have a few questions that we wanted to get feedback on: What in the City of Langley creates a sense of pride and why? What do you think should be a priority for the City over the next 5 years? Would you support an infrastructure levy? From last night's meeting. What would you be willing to pay to keep our infrastructure in a state of good repair? Select image to enlarge. So far there have been two meeting, last week there was a meeting at Nicomekl Elementary School and last night there was a meeting at HD Stafford. The meetings started with the mayor giving a mini-state of the union. Afterwards, people went to one of the many booths staffed by members of various City departments or the RCMP. Members of council were also wondering around, answering some questions and hearing from residents. So far around 200 people have attended the public meetings, and I’ve personally had some really good conversations with people who live in the community. Addressing homelessness has certainly been on the top of the priority list for the City of Langley over the past several years. Over the past month, with the help of BC Housing and the Salvation Army, we have been able to get people out of our parks and into shelter spaces. There is still much work to be done. At the meeting, addressing homelessness was certainly a topic that came up, but it wasn’t the topic I heard about the most from residents. When it came to investing in infrastructure, people were very supportive. Who wants their community to crumble apart? I heard loud and clear that people were willing to invest as long as they knew where the money was going. I’m in full support of an infrastructure fund that is dedicated to replacing aging roads, water, and sewers lines. As for roads, I also heard loud and clear that people want better sidewalks, bike lanes, and traffic calming. In our parks, people commented that they want more investment in our trail system. This again is something that I fully support. The 203rd Street project is an example of a road that will be traffic calmed with improved sidewalks and protected cycling lanes. If this project is successful, I would certainly be interested in doing the same thing along Grade Crescent and along 53rd Avenue. Our parks department is now focusing on basic maintenance of our parks system. For example over the next little while, the City will be installing new wayfinding signs to help people better navigate our extensive trail system. 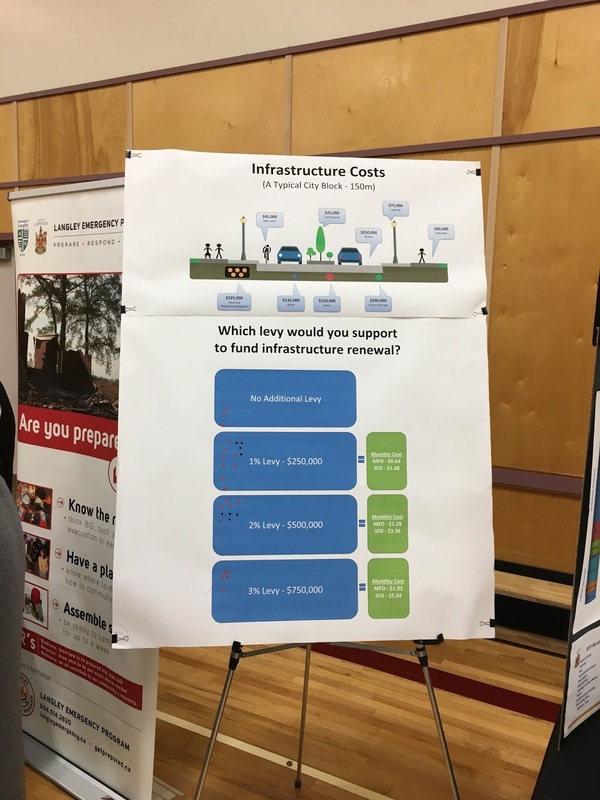 I had one person approach me about the proposed rainbow crosswalk in Fort Langley, expressing concern about the cost. I let them know that this is a Township of Langley matter.